An informal women’s group called University Women’s Information Network (UWIN) formed in the 1970s. The group decided that the university needed to establish a Women’s Center. Former U of L president Donald Swain approved of the creation in 1972. In 1975, U of L students brought Betty Friedan, whose book, “The Feminine Mystique”, helped spark the Women’s movement that led to the creation of a full-fledged academic study devoted to women’s issues. In 1983, U of L created a minor in Women’s studies, 2004 Master of Arts in Women’s and Gender Studies created, the first graduate degree available in the field of women’s studies or women’s and gender studies in the commonwealth of Kentucky. In 1993, U of L’s President, Dr. Donald Swain, appointed the Task Force on the Status of Women to assess the status of women faculty and staff at the university and recommend changes to improve that status. The Commission on the Status of Women was established as a result. The Women's Center sits on the Commission as an ex-officio member. 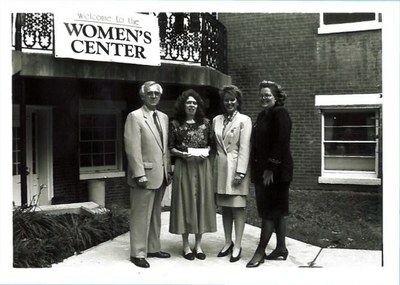 March 21, 1992, the Women’s Center was created and located in Gardiner Hall with Judi Jennings serving as the Director. Women’s Center Council created which consisted of approximately 40 members from the University and community at-large. Each council member served on one of six committees that included programming, finance, public relations, community-building, gender equity, and student advisory. It was restricted in 2000 and disbanded in 2006. The Center won funding for the Lila Wallace-Reader’s Digest Foundation for the Louisville American Festival Project, “a nationally recognized coalition of artists and sponsors who use the arts to build understanding between diverse people and forge community alliances. 1st Women of Color Transformation Tea began in 1997 and is an open forum for the diverse spectrum of women of color and friends on the U of L campuses. The Tea affords women an opportunity to empower one another by offering networking opportunities and recognizing the UnSung She-ros of the University. The Women’s Center received a $500,000 grant from the department of justice for prevention, education and advocacy on campus and in the community (PEACC). The program encourages a proactive approach to violence against women through training, education and networking among campus and community organizations. The Women’s Center co-sponsored PEACC’s Take Back the Night. The purpose of the Annual Take Back the Night is to bring together organizations, civic leaders, and individuals of Louisville and Jefferson County to protest violence against women and to promote awareness of the attitudes, beliefs, and behaviors, which perpetuate this specific type of violence. Our federal grant to combat violence against women was renewed for PEACC. The university received $380,000 from the Department of Justice under grants to reduce violence against women. Naomi Wolf, Author of The Beauty Myth, was the keynote speaker for the Women’s Center 10th anniversary dinner: An Evening with Naomi Wolf. Mary K. Bonsteel Tachau Gender Equity Award created - This award is given to a member of the U of L community who has done significant work towards gender equity. It is named in honor of Mary K. Bonsteel Tachau, constitutional scholar, the first woman to serve as chair of the U of L history department, and the first woman chair of the faculty senate. Dr. Tachau was active in pay equity struggles at the university and in many other issues both on campus and in the civic community. Her papers are part of the Women’s Manuscripts Collection in the U of L university libraries. Dr. M. Celeste Nichols Award created -This award is given to UofL graduate students for travel or other professional development needs apart from tuition or books. It is named in honor of M. Celeste Nichols--student, scholar, mentor, and professor. She was the first African American to receive a Ph.D. from UofL’s English Department. Dr. Nichols taught African- American literature and basic writing at UofL, Kentucky State University and at Bellarmine University before her death in 1996 at age 45. This award is given with generous support from the Commission on Diversity and Racial Equality (CODRE). Health Promotion & the Women’s Center partnered for ‘Body Appreciation, Body Awareness Week’ where Advertising Analyst Jean Kilbourne spoke at U of L. Jean Kilbourne is recognized for her work on alcohol and tobacco advertising and the images of women in advertising. The lecture was based on her book Deadly Persuasion: Why Women and Girls Must Fight the Addictive Power of Advertising. Modern Outlook on Motherhood - The women’s Center established an RSO for student mothers that provided resources to moms that were also perusing degrees. The Center won a grant from the Commonwealth of Kentucky to provide “supplemental work-study like grants” for UofL students who are recipients of Temporary Assistance to Needy Families. Champions 4 Her walk, run festival was a new local event that brought together non-profit organizations to raise funds for and awareness on the issues facing local women. 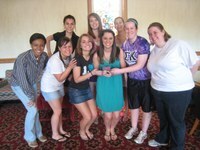 Women 4 Women Student Board won the Outstanding New Organization Award from the UofL Student Life. Student-Parent Association was established for student-parents by the women’s Center at U of L. The purpose of the group is to promote the academic success of the university’s student parents. Women 4 Women Student Board won Student Organization of the Year from the UofL Student Life. Women 4 Women won Recognized Student Organization Advisor of the Year from the UofL Student Life. Women 4 Women Student Board founded the first Kentucky Statewide College Women’s Leadership Conference which received sponsorships of over $20,000 and provided sponsorship to over sixty attendees. Women 4 Women Student Board hosted it's first Start Smart Salary Negotiation Workshop, empowers women with the skills and confidence to successfully negotiate their salary and benefits packages. The American Association of University Women (AAUW) at UofL now host this program. Women’s Empowerment Award created - is given to an individual, community member or business who through their professional work, personal passion or sponsorship empower women supporting the mission of the UofL Women’s Center. In 2013 the WC added a global trip focused on international women’s issues going to Peru. Spain, Morocco and India have been trips since its inception. A Women Veterans Group was established, comprised of women student veteran from all branches of the military as well as Active Duty, Reserves or the National Guard, is designed to provide each other with a supportive community, network of friends and empowering each other to succeed in academics and beyond. Campus Talks, discussions with topics addressing relevant issues to all UofL students providing a safe space to talk. Past topics include: domestic violence, portrayal of women in the media, and street harassment. The Center increased its staff which now consists of the Director, Business Unit Manager, & 2 Program Coordinators. The American Association of University Women (AAUW) at UofL was established, the first American Association of University Women student organization in the state of Kentucky. AAUW at UofL hosted its first Elect Her program, which offers an unique experience where students will practice hands-on campaign skills and hear from inspiring local speakers. Ann T. Allen Endowed Scholarship - The Ann T. Allen Endowed Scholarship is for current University of Louisville undergraduate students that are single-parents in A&S. University of Louisville Women’s Network (ULWN) was established as an inclusive organization committed to encouraging and promoting the personal and professional development of women faculty and staff at UofL by working in collaboration with University partners, the Women’s Network will give women access to valuable contacts and information on programming, sponsorships and networking opportunities. Empowering Ladies Together (ELT) comes to the Women's Center with Jamieca Jones as their advisor. The UofL Alumni Association, in collaboration with the Women's Center, has created the UofL Women’s Alumni Council which seeks to strengthen the bond between the university and alumnae, create and promote community service opportunities, help advocate for and mentor students, support the work of the Women's Center, and work collaboratively to develop networking and engagement opportunities. Women 4 Women Student Board held its first Feminist LGBTQ+ Trivia Night. The Women's Center, in partnership with Humana, UofL Speed School of Engineering and UofL College of Business, hosts the inaugural Grace Hopper Celebration of Women in Computing Watch Party, the world's largest gathering of women technologists. Students attending are empowered by the keynote speakers of the Grace Hopper Celebration and network with local STEM professionals. The Tampon Task Force, spearheaded by the American Association of University Women (AAUW) at UofL and the UofL Women’s Center, started in 2016 when students approached the Women’s Center with concerns about the lack of access to personal hygiene products on campus. To address the need on an institutional level, the Women's Center reached out to the Student Government Association to use their access and resources to expand this initiative. Beginning in Spring 2017, the Student Government Association has worked diligently to see the creation and implementation of free access to personal hygiene products. In 2018, through the collaboration of the Women's Center, the Office of the Chief Operating Officer and the Student Government Association (SGA), specific dispensers are located on all 3 UofL campuses with free personal products. Wanting to look at women's issues on a global scale, the United Nations Association (UNA) Women at UofL was established, the first and only UNA-Women student orgazation in the country. The American Association of University Women (AAUW) at UofL hosts its inaugural Empowerment: Making and shaping History - Women in Space Science. Over the decades, women have made significant contributions to space science. Their are acknowledged and celebrated in a series of events including film screenings and keynote speakers including NASA Astronauts. The United Nations Association (UNA) Women at UofL hosts its inaugural Symposium which focused on ending child marriage in Kentucky. University of Louisville Women’s Network (ULWN) hosts its inaugural Roundtable Discussion which brings together faculty and staff from all campuses with subject matter experts/facilitators who will guide small group discussions. The American Association of University Women (AAUW) at UofL hosts its inaugural Menstrual Hygiene Day to raise awareness and change negative social norms surrounding menstrual hygiene with interactive activities.